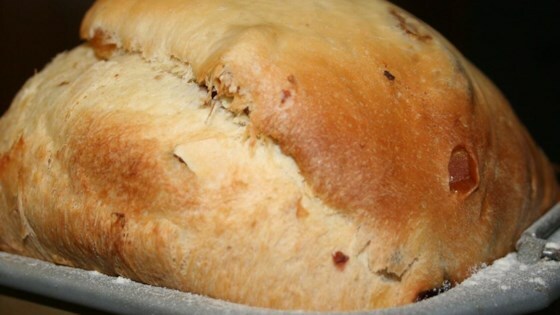 "This is an Italian Christmas bread. This recipe is only suitable for the bread machine. I have tried it many times successfully, you will love it." Place all of the ingredients except for the mixed fruit into the pan of your bread machine in order directed by manufacturer. Select Sweet or Basic/White bread cycle, and use the Medium or Light crust color. Do not use the delay cycles. Add the fruit 5 to 10 minutes before the last kneading cycle ends, or when the raisin or nut signal starts. Terrific recipe! I added 1/4 tsp each of lemon extract and almond extract. I used golden and brown raisins and candied lemon peel. This recipe came out great! I substituted fiori di sicilia (1/2 tsp.) for part of the vanilla for a more authentic flavor. This sure beats paying $10 for every loaf. Very good with or without the dried fruit. Excellent recipe. Came out perfect the 1st time.